We are a leading Wholesaler of roff bond repair, dr. fixit pidicrete urp (20 kg), dr. fixit super latex (5 kg), sika latex power, sunanda hack aid plast (20 kg) and sunanda rusticide from Mumbai, India. 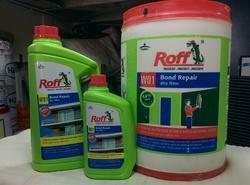 Roff Bond Repair is a Styrene Butadiene Polymer Based Latex specially developed to form a matrix with cement. Roff Bond Repair is used as a bonding agent between old & new concrete, for cementitious substrates, waterproof coating to small areas in bathrooms, balconies & small roofs. It is also effective to make repair mortars & concrete in building rehab works. Dr. Fixit Pidicrete URP is based on modified styrene butadiene latex supplied as a ready to use bonding agent in liquid consistency. It is used for repair of spalled concrete – floors, columns, beams, chhajas, slabs & waterproofing of toilets & bathrooms, small terraces etc. as it bonds strongly to old & new concrete and to plasters. It reduces shrinkage, prevents cracking, dust pick up & improves abrasion resistance. For concrete repairs - Spalled concrete of floors, columns, beams, chajja, slabs, parapets, etc. 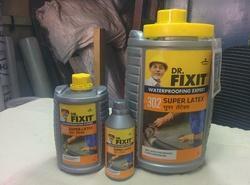 Dr. Fixit Super Latex is based on modified styrene butadiene latex used for high performance applications in waterproofing and repairs. It is used for repairs of spalled concrete such as – floors, columns, beams, chhajjas, slabs & waterproofing of toilets, bathrooms & terraces. It bonds strongly to old & new concrete or plaster. As crack repair – Plaster cracks more than 5 mm, In gaps developed between masonry and RCC members. As coating for prevention of corrosion in rebars. Bond agent - Mix Dr. Fixit Super Latex, water and cement in 1:4:7 proportion by volume and apply this mix with brush in a single coat over the clean any surface. Renders, patching & crack repair mortar - Mix 5 kg of Super Latex with 15 ltr of water 50 kg cement and 150 kg sand. Fill the crack with above prepared mortar. Compact it into the crack fully and trowel finish to level. 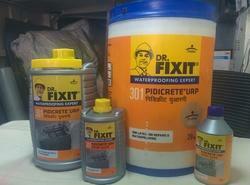 Waterproof coating - Mix Dr. Fixit Super Latex, water and cement in 1:4:7 proportion by volume. Apply 1st coat when the surface is in saturated dry condition and allow it to dry for 4 to 6 hours. Overlay the 2nd coat with screed/plaster for protection and finish. Sika® Latex Power is a synthetic rubber emulsion which when added to cement slurry/ cement mortar/concrete/grout provides good adhesion and water resistance. It comes in the form of a milky liquid. 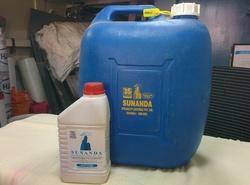 It is fully soluble in water and is to be added directly to the gauging water of mortar/concrete/ cementitious grout. For making polymer mortar for repairs mortars etc. 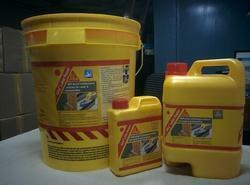 Makes the mortar waterproof and reduces susceptibility to acids and gases, salt petre action etc. Mortar with Sika® Latex Power shows extremely good bonding to bases like concrete, stone, brick etc. Fab 1 fabric layer in between 1st and the 2nd coat. HACK AID PLAST is a unique single pack polymeric solution that strengthens the bond between plaster and new and old concrete greatly. 1. HACK AID PLAST holds the concrete tightly due to interaction polymerisation. 2. As the concrete cures, the bond strength also increases. 3. Non-ionic, no possibility of attack on concrete by chlorides, alkalis, sulphates, etc. 4. It does not have any corroding or deteriorating effect on the reinforcement steel. 5. The bond between steel and concrete is also preserved by HACK AID PLAST. 7. In general, in many repair cases gunniting does not last due to inadequate bond. This may be easily remedied by HACK AID PLAST. Use of HACK AID PLAST as a bonding layer before gunniting reduces the rebound loss. RUSTICIDE is a single component sulphate and chloride free liquid, which in one operation removes rust and prevents further rusting of steel. New/ old reinforcement steel in new construction. Embedded steel in repairable structures. Various steel structures like tanks, water pipelines, effluent pipelines, trusses, purlins, rafters and other structural members. RUSTICIDE performs rust removal and rust prevention in one operation in mild conditions. LAPOX LACRETE is a room temperature curing epoxy system suitable for concrete primer, epoxy grouts, epoxy mortars, reairing compond and as a binder between old and new concrete. Low mix viscosity of system permits high filler loading and exibit outstanding mechanical and chemical resistance properties. It is a multi purpose system for various civil jobs. Lokfix is a two-component polyester resin anchoring grout, meeting the requirements of BS EN 1504-6: Anchoring of reinforced steel bars. Supplied in pre-measured quantities, the material cures quickly to give consistent, high performance anchorages. Lokfix P : Thixotropic grade, 25 minute gel at 20°C for use in overhead or horizontal holes where the hole is up to 25 mm greater in diameter than the bar. 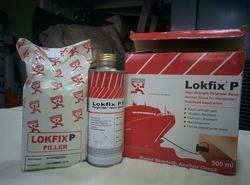 The thixotropic nature of Lokfix P reduces flow of grout out of the hole.